These are the words that are written on the glass door of a “Blessing Box” that stands outside Davis Memorial Presbyterian Church in Elkins, WV. Inside are canned goods and other non-perishable items that are free to the community, not only now during this holiday season but throughout the entire year. Davis Memorial is home to a long-running food pantry that is open 5 ½ hours each weekday. That means that if someone needs food and is not available during those hours, they must go somewhere else to find food. 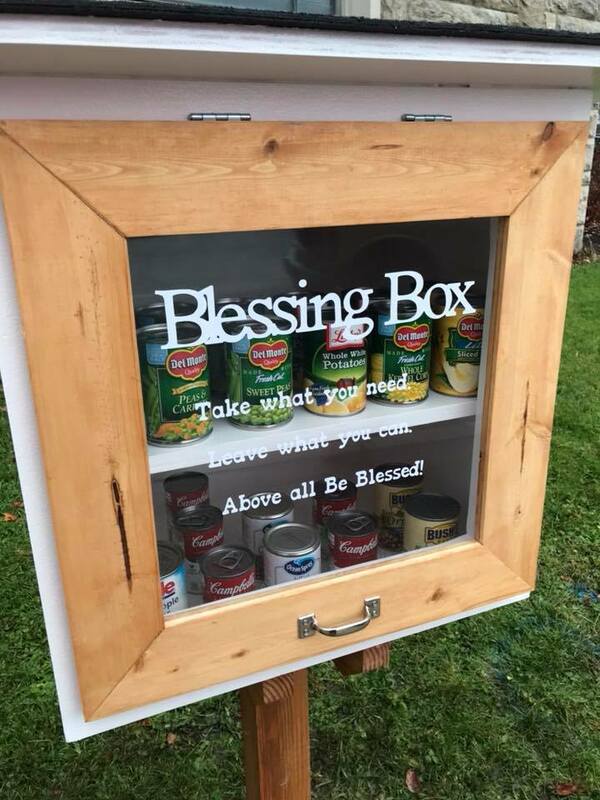 This Blessing Box, which holds roughly 20 total cans and boxes, allows those in need to be able to get food every day and at any time of the day. Living on the streets is an issue in Elkins. The homeless shelter there is usually full, and normally hunger goes hand-in-hand with that situation, making the food box even more vital. 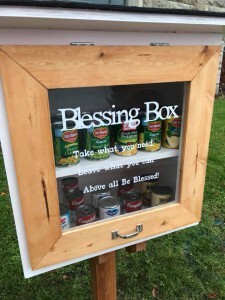 The Blessing Box outside Davis Memorial is the second of its kind in Elkins. Three blocks away at the city hall building, the first Blessing Box was erected a few months ago. The woman who initiated the first box is working with the Elkins mayor to try to get more of these Blessing Boxes erected throughout the city. Both Blessing Boxes are identical in construction. That’s because the Elkins Mountain School, a private institution for boys at risk, has the blueprint for the boxes and is constructing them as they are requested. Davis Memorial’s food pantry filled the Blessing Box the first time in early December with cans and boxes of food, but the goal is to have the congregation and others in the community keep it full in the future. Not only is Davis Memorial connected with the Blessing Box program, it is also involved in other similar initiatives. The church’s Witness Service Committee is preparing 30 food baskets to be handed out during the Christmas season, and the church also brings in a large truck from the West Virginia Mountain Food Bank twice a year to make food available to those in need. Also, each year Davis Memorial participates in a Great Day of Service where the congregation is involved with projects in the Elkins area, and four times a year it works as part of the Common Grounds Café where churches rotate on preparing a Saturday meal for the community. It’s all part of the fabric of Davis Memorial Presbyterian Church, which now includes a 24-hour food box right outside the office doors.